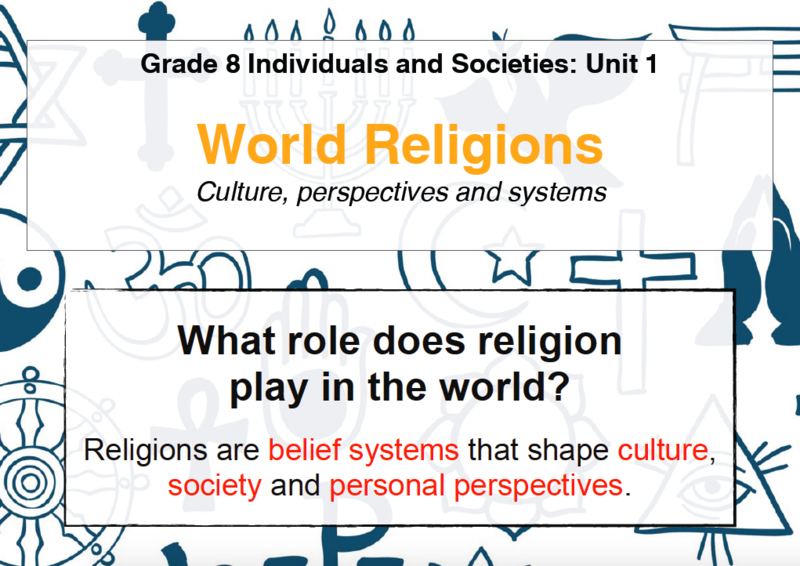 Session 1 – Intro to World Religions. What does the term religion mean? What role does it play in human society and culture? Today we will define the concepts of religion, belief and systems and apply our understanding in a creative collaborative activity. The major world religions followed today worship one god (monotheism). Today, we learn a little about the ancient religions that worshipped many gods (polytheism). In this lesson, we learn how the three major monotheistic religions most common today formed and developed. We will investigate the common features and shared origins of Christianity, Judaism and Islam, showing our understanding in timelines and Venn diagrams. Session 4 – Secular or Sacred? Today we distinguish between the terms ‘secular’ and ‘sacred’ and examine common features of many religions. We will also introduce and start the first project of the year. We start the first research project today, learning how to craft research questions, access encyclopaedias and databases, evaluate sources, and record our information. Learn to put together an effective slideshow and prepare to give an engaging oral presentation in this lesson! In this lesson, we will watch a documentary with Morgan Freeman entitled ‘The Story of God’. We will use the documentary as a stimulus to try and extend our knowledge and understanding of world religions. In these final lessons, we will create an essay – based on research – that answers questions about world religions.